Above: Hanging two sided oval acrylic address plaque mounted to a Comfort House 12" J0012 sign bracket. Welcome to Comfort House. 2019 is our 28th year of business. 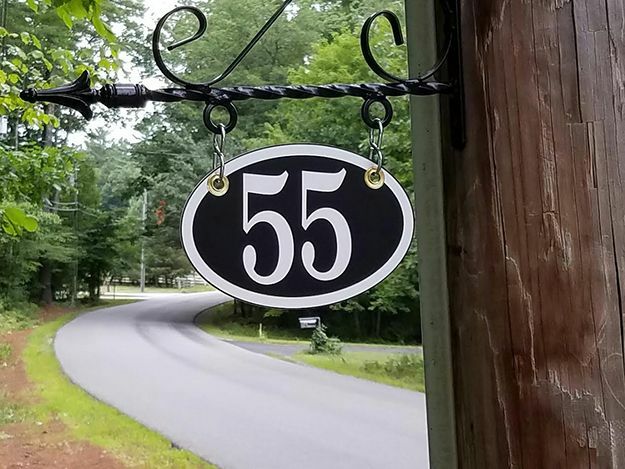 We manufacture and distribute address plaques and custom signs, personalized gifts, engraved bricks, personalized picture frames, and a distinctive assortment of home and garden products. We serve clients around the world with one of the most extensive selections of custom address plaques and address signs found anywhere. Please begin your custom address plaque search by using our Address Sign Finder. Use tabs at the top of this page to begin your search for additional personalized signs and plaques, personalized gifts, and house and garden products. To request a quote for a custom sign design, please use the request a custom quote link at the top of the page. Thank you to our clients who shared their plaque photos that appear above and below. You may click on the photos to take you directly to the products shown. We appreciate your shopping at Comfort House!